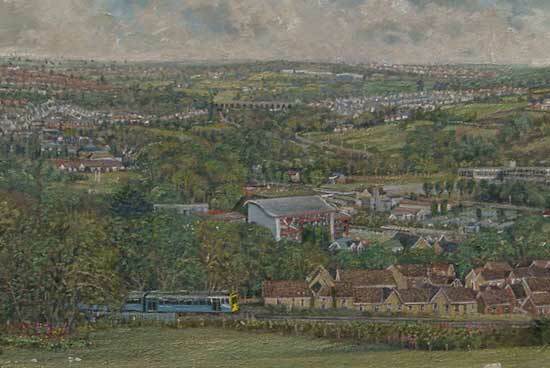 Painting of Ystrad Mynach with Hengoed viaduct in the distance. This painting is what my work is all about - local landscapes. It covers my home town of Ystrad Mynach, parts of Maesycwmmer, Cefn-hengoed and through to Gelli Haf in the distance above Hengoed Viaduct. The biggest change which was completed in late 2011 was the building of the new Hospital on the grounds of Ystrad Fawr. The arrival of the Hospital has had its casualties. 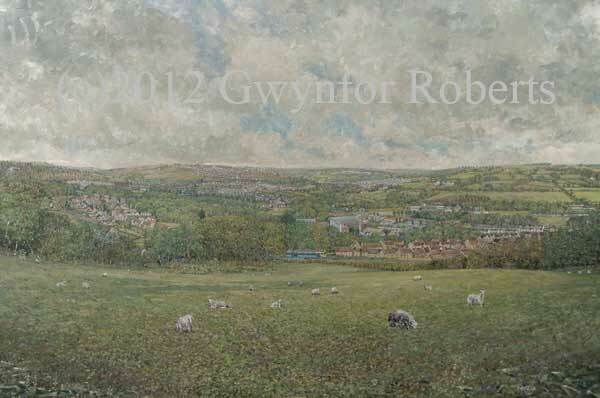 Local hospitals in Aberbargoed, Oakdale, Caerphilly Miners' and Ystrad Mynach (still seen in my painting) have closed. This side of the valley I've shown the Valley Line Rhymney to Cardiff train passing through and visible on the other side of the valley is the Newport to Brecon line - closed in the early 1960's. A view of Ystrad Mynach with Hengoed viaduct in the distance.It captures the area of Ystrad Fawr and Ystrad Mynach Hospital prior to the building of the new hospital at Ystrad Fawr. This is quite a big painting which can't be fully appreciated so I have added some detail below. The above detail shows Hengoed Viaduct with Hengoed on the left and Maesycwmmer on the right. Behind the viaduct is Gelli Haf and the Gelli Haf Isaf farm. The College is there and also Ystrad Mynach Hospital - closed 2012. A Valley Line train is passing through to Cardiff. Alongside the railway line can be seen the ystrad Mynach Signal Box - the station being just up-line. Also, the old Twyn bridge would have been just where the dirt tracks lead into the trees . Lastly, this detail shows the old Coal Board Offices turned Caerphilly Council offices and Ystrad Fawr House/Registry offices on the grounds of Ystrad Fawr - The new Hospital for the County of Caerphilly replaces these buildings.The playing fields at Ystrad Fawr once held the Bedwelly show and in this scene Penallta rugby Club are playing. Cricket was also played on these grounds. Also in the detail and just above the rugby field is the Greyhound racing track.